You would expect this kind of thing in Louisiana or New Jersey, but not southern Colorado: two undertakers killing a third. One of the murderous morticians was even the mayor of his small town. Filmmaker Devin Hume knew the real-life accused as helpful members of the community, so he tells their story with a good deal of compassion in Making a Killing (trailer here), which opens this Friday in Los Angeles. Frankly, it is rather amazing how little Hume and co-screenwriter Jamie Pelz embellished their narrative. Arthur Herring is an awful lot like his true crime analog, but maybe a little more schlubby. In addition to his mayoral and embalming duties, Herring is also the town pastor and he owns everyone’s favorite diner. His partner in all these ventures is his younger brother Vincent (no, not Vincent Herring the alto saxophonist), but it is always clear Arthur calls the shots. It turns out they also have some rather felonious inclinations, especially with regard to Lloyd Mickey, a supposedly friendly rival. According to their plan, the Herring Brothers would help out their friend-in-need, by holding onto his cash and rare coin collection while he served time on an icky molestation conviction, thereby protecting his finances from lawsuits. Now that Mickey is out, he wants his money back. One thing leads to another, with the upshot being one dead ex-con mortician. Since they do not have a lot of murders in these parts, hard-charging Orlando Hudson is dispatched from the state’s Criminal Investigation Department. Of course, he gets a chilly reception from Chief Riley, even before evidence starts to link the Herrings to the murder. The case that inspired Making a Killing is pretty crazy, but the best part of the film is Michael Jai White swaggering through town as Hudson. Once again, he brings attitude, physicality, and a larger than life presence. Frankly, he deserves to be a top-shelf box-office draw, but neither life or Hollywood are fair. It is also satisfying to see a veteran character actor like Mike Starr get to enjoy a rare star turn as Mayor Herring, convincingly portraying him as a tragic figure, who lets his dodgy business spiral out of control, despite his better judgement. Just like White and Starr, Christopher Lloyd has instant credibility playing weird oddballs. Mickey is a darker figure than his iconic characters, but he is believably creepy inhabiting the skin of the unsympathetic murder victim. Jack Forcinito also adds some grit as Chief Riley, particularly in his tense scenes baiting Hudson. No doubt about it, this is our kind of cast. Unfortunately, there is too much slack in the screenplay. Hume spends way too much time getting to know the Herrings and their hopes and dreams. Bringing out the complexity of their personalities is one thing, but they are killers, so we only want to identify with them only so far. 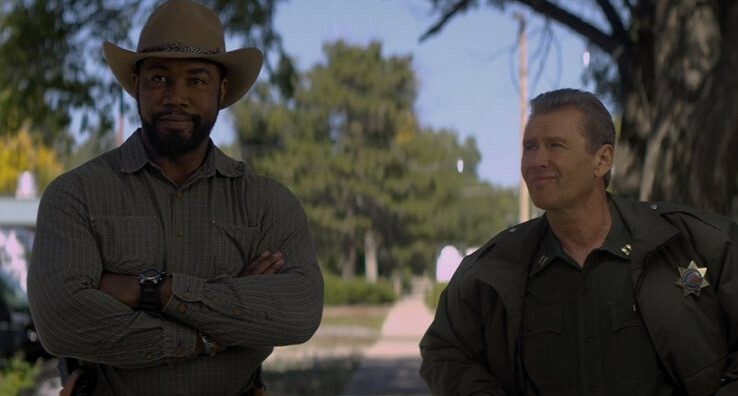 Still, you cannot go too far wrong with Michael Jai White doing his thing and the high lonesome New Mexico backdrops (where it was shot). We’ve definitely seen worse, but interested viewers can wait for VOD or DVD. 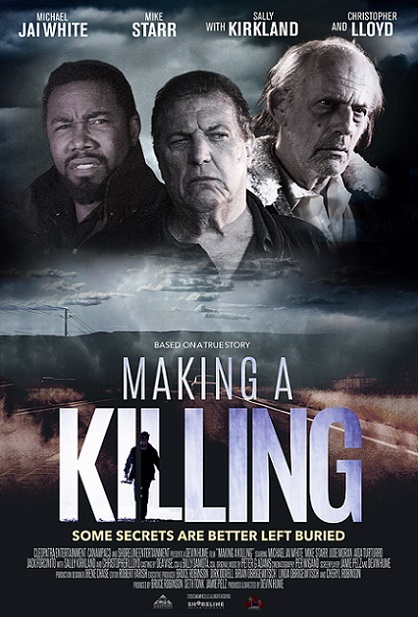 In the meantime, Making a Killing opens this Friday in LA, at the Laemmle Music Hall.